Posted on Wed, Feb 17, 2010 : 6:05 a.m. Downtown Ann Arbor lost one of its visionaries with the death last weekend of the owner of the Full Moon restaurant on South Main Street. Andy Gulvezan died Sunday while in the care of Arbor Hospice of complications from a bone marrow transplant to treat a recurrence of leukemia. 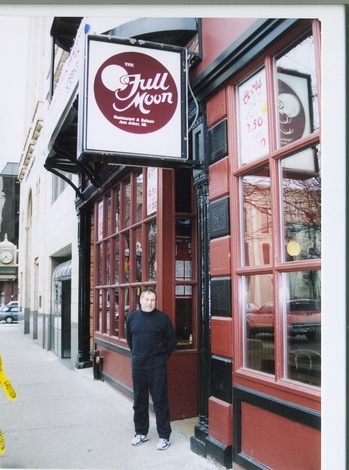 Andy Gulvezan stands in front of the Full Moon on South Main Street a few years ago. Besides owning the Full Moon, Gulvezan spent decades creating new restaurant concepts downtown, setting the tone for what today is regarded as one of the state’s leading entertainment districts. “Andy made downtown Ann Arbor the way it is,” said Jim Chaconas, a 40-year friend and business associate. 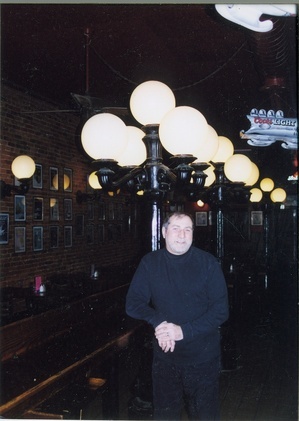 Gulvezan launched his career with Robert Babcock, now an Ann Arbor attorney, when the pair opened the Whiffle Tree Restaurant on West Huron Street, between Ashley and South First. That was in September 1973, after they bought the former New Odyssey and converted it into a 100-seat restaurant that quickly turned into a downtown landmark. The pair envisioned a casual hamburger place, but during construction the plans changed. The restaurant had lines for lunch and dinner, and Babcock recalled one football Saturday when the line stretched east across streets, eventually meeting another very long line: one for the Old German on West Washington. Patrons included townies, visitors, even the famous: Playwright Arthur Miller stood in line one night. “We had pretty good food at a reasonable price and we appealed to a lot of different types of people,” Babcock said. “They all felt comfortable being there next to each other. Many in Ann Arbor look back at the Whiffletree as a key part of Ann Arbor’s dining history, before the restaurant burned down in 1987. The partners expanded the building a few times before they split up over a reason that no longer matters, Babcock said. “We had a little dispute over nothing,” Babcock said. Looking to move on, Gulvezan eyed opening a tavern, soon buying a building in Ypsilanti Township. It was the former Gingham Inn on Washtenaw, which most recently housed a Cottage Inn CafÃ©. Gulvezan called his bar Gypsy, then renamed it Armadillo Truck Stop and Country Club, said Jim Chaconas, who recalled the beach parties in the basement and big summer picnics on site. Andy Gulvezan stands inside the Full Moon in this undated file photo from the Ann Arbor News archives. But it wasn’t long before Gulvezan sought to launch another concept, this time back in Ann Arbor. 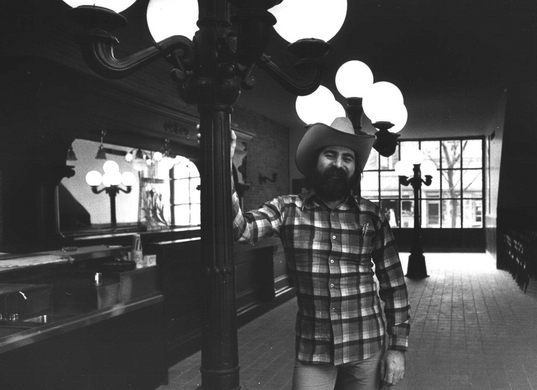 Chaconas sold Gulvezan and two partners the building on South Main Street that he turned into the Full Moon Bar in 1982. Gulvezan, a former house painter, did much of the renovation himself. The Full Moon brought him back to downtown, Chaconas said, and the restaurant’s success allowed other prospective proprietors to see the potential for Main Street to become a lively destination for dining and nightlife. “He’s the one who made Main Street successful,” Chaconas said. Gulvezan started a beer club at the Full Moon, offering an endless selection of imported and specialty beers. Members got a card, and after plowing through a certain number of varieties, they’d get a gift. Just offering that type of variety was different for a bar in the 1980s. “He went out and sought these beers,” Chaconas recalled. Among them: Beers from Frankenmuth Brewery, which made the first delivery to the Full Moon in a horse-drawn cart after officials closed Main Street to cars. And Billy Beer, the brew of former-President Jimmy Carter’s brother, Billy Carter. Gulvezan also brought the tapas restaurant to Ann Arbor, as part of the concept at the Monkey Bar. Gulvezan helped launch outdoor dining on Main Street. And he was among the first to renovate upper floors of a retail building, turning space above the Full Moon into a loft. “Andy would come up with wonderful ideas,” Chaconas said. The ideas extended to multiple bars over the years, as Gulvezan created concepts and then put them into his downtown buildings. The Full Moon occupied its current space at least a few different times. The Crow Bar, The Liberty Bar, The Flame, City Grill, the One-Eyed Moose, Crush and Blue Wolverine Sports Bar all were Gulvezan’s. He bought buildings, too, in time leasing space to other bars or restaurants downtown, like the Melting Pot and Pacific Rim. Gulvezan also maintained a presence downtown over the decades. He stopped in at Afternoon Delight nearly every day for coffee, Hackett said. He was often stopped while walking downtown by people who knew him and wanted to talk. Gulvezan always remembered their names and details about their lives. And Gulvezan, who loved people and story-telling, never stopped talking to his patrons. That was true especially in recent years, after the physical changes of recovering from a bout with leukemia and a stroke slowed some of the former marathon runner’s activity. And he remained vitally interested in his businesses. Magda Gulvezan, his wife, said that didn’t change over the recent months that he spent at the Karmanos Cancer Institute in Detroit. Gulvezan was diagnosed with leukemia four years ago, the day after he and Magda finalized plans to build a house. He battled that cancer, then suffered a stroke in December 2007, between Christmas and New Year’s Day. Then, in August, the leukemia reappeared. Gulvezan started chemotherapy treatments at St. Joseph Mercy Hospital, staying there for a month. He returned to his Saline home for two weeks, then by mid-October entered the Karmanos Cancer Institute in Detroit for a bone marrow transplant, which was done Oct. 23. He remained there for months, before moving to Arbor Hospice on Feb. 7. “He had a lot of complications,” Magda Gulvezan said. Gulvezan fought to regain movement after his stroke. His wife said he was partially paralyzed, but within six months was able to drive again. He brought that spirit to the battle against leukemia. “He did fight very, very hard for a long, long time,” she said. Gulvezan battled because of his family: Magda and their children, Kristofer, 11, a middle school student at Greenhills; and Oriana, who will turn 10 on Monday and attends Emerson School. Over time, Gulvezan built a teddy bear collection for Oriana, buying bears as holiday gifts. It’s a tradition that the children cherished as their father fell ill, buying him a teddy bear for his stay at Karmanos. Other family memories surround sports, like the times he coached basketball or took the children to University of Michigan football games and tailgate parties. The family has “hundreds and hundreds” of photos, Magda Gulvezan said, and they spent time together on Monday sorting them. Andy Gulvezan, shown inside the Full Moon in recent years. As word of the gravity of Gulvezan’s illness circulated, many former employees reached out, stopping by to see how he was and setting up a Facebook page to reminisce about their time working with him. Gulvezan changed the names and concepts of his restaurants on what may have seemed to outsiders like whims. He also let his opinions be known, especially on business matters in the city. “You may not always agree with him, but he’d let you know how he felt about an issue,” Shaffran said. But his commitment to the blocks of downtown Ann Arbor where he started his dream of owning a restaurant did not change. The names changed. The menus and concepts did, too. But the location, from the time he opened the Full Moon, never did. Visitation for Gulvezan will take place Wednesday from 4-7 p.m. at the Muehlig Funeral Chapel, Ann Arbor. Funeral services will take place Thursday at noon at the First United Methodist Church, Saline. Paula Gardner is Business Director at AnnArbor.com. Contact her by email or follow her on Twitter. Reporter Nathan Bomey contributed to this story. Sun, Feb 21, 2010 : 11:07 p.m. I think Gulvezan killed The Flame Bar...damn him. If I am wrong, please correct me. Sat, Feb 20, 2010 : 3:18 p.m.
Thu, Feb 18, 2010 : 8:29 a.m.
Zags- Face book group is called "Full Moon Cafe"
Thu, Feb 18, 2010 : 12:08 a.m. Does anyone have info regarding the facebook page mentioned in the article? I haven't been able to find it. search Full Moon Cafe. Wed, Feb 17, 2010 : 8:33 p.m.
Andy was a true Ann Arbor icon. The Wiffle Tree was in my opinion, the best restaurant Ann Arbor has ever had. And then there was the Full Moon. Who else remembers the fabulous potato skins made from small, redskins? The Moon was such a great place to work back in the 80s. We knew it was something special and looked forward to being there, especially on the weekends. True that it seemed as though Andy had to be always developing a new establishment or changing an old one. Glad that The Full Moon lives on as a shrine to Andy's success. When we heard that Andy was nearing the end of his a life, a handful of us gathered at The Moon this past Friday to reflect on the good ol' days. His family will find peace in knowing that Andy made an enduring difference on Main Street. Wed, Feb 17, 2010 : 7:51 p.m. Does anyone have info regarding the facebook page mentioned in the article? I haven't been able to find it. Wed, Feb 17, 2010 : 4:22 p.m. I remember Andy when I was a little girl and was petrified of his mustache! My parents, who were both downtown business owners, loved taking me to the Whiffle Tree and Full Moon. As an adult, I had a great relationship with Andy talking business, politics, and business politics :). It didn't matter where he caught me... in the alley, parking structure, or outside dining, we could talk at length about anything. He DID try very hard to beat this disease. He talked often of his wife and children. My thoughts are with them during this unbelievably sad time. I am so full of sorrow to see another Ann Arbor legend gone. RIP Andy. Wed, Feb 17, 2010 : 3:01 p.m. He also ran the first Irish bar in town, Kitty O'Sheas. Live Irish music Thursdays and Sundays in that tiny little place with a grill behind the bar. Good times, boss. Wed, Feb 17, 2010 : 2:36 p.m. He was a man of vision that could change with the times. The Whiffletree was a fabulous hangout and people of all varieties were comfortable there. The food was great and the atmosphere was always festive. Ann Arbor had a lot less pomp and a lot more spirit in those days. I hope his wife and children have many great memories to see them through this hard time. Wed, Feb 17, 2010 : 12:24 p.m.
Another first for Andy: The Armadillo Truck Stop and County Club was the first business in Washtenaw County to have a mechanical bull. His vision was immence. RIP Andy. Peace. Wed, Feb 17, 2010 : 11:15 a.m. I had no idea how many terrific Ann Arbor hang outs Andy was involved in. Some of my very favorites growing up here - Whiffletree, Full Moon (I may still have the hat I won for trying out 50 beers.) To me, he was a great Dad to Kristopher and Oriana here at Emerson, and will be missed. Wed, Feb 17, 2010 : 10:51 a.m. Sadly another Ann Arbor icon has left us. The Wiffletree is memorable as is Andy, who will be missed even more...by his family and all of us. Full of big ideas, he thought also of having restaurants in Romania. Excellent story. Wed, Feb 17, 2010 : 10:20 a.m.
-----But the Full Moon opened in 1982; Jimmy Carter was President from January 20, 1977, to January 20, 1981. nitpicking obituaries. seriously. Wed, Feb 17, 2010 : 10:13 a.m. Sorry, that's my fault - will change to "former President." Wed, Feb 17, 2010 : 10:11 a.m.
"'He went out and sought these beers,' Chaconas recalled. Among them: Beers from Frankenmuth Brewery, which made the first delivery to the Full Moon in a horse-drawn cart after officials closed Main Street to cars. And Billy Beer, the brew of then-President Jimmy Carters brother, Billy Carter." -----But the Full Moon opened in 1982; Jimmy Carter was President from January 20, 1977, to January 20, 1981. Wed, Feb 17, 2010 : 10:10 a.m. He was a great friend and mentor. We used to have fun watching Newhart at 3 am. I would close Kitty O'Sheas and then walk over to the Full Moon (when it was down at the old City Grill). I'd make some nachos and we would laugh at Carlin, his favorite character on the show. My eventual wife would call at 4 or 5 and he delighted in saying "He just left!" I remember all his stories like it were yesterday. And I'll never forget the time when we were up north in Ishpheming together buying stuffed taxidermy for the One Eyed Moose. We couldn't figure out why all the motels were full until the waitress asked us if we were successful. We said sure, we got a moose, some ptarmigan, and a couple of big fish. Then we figured out we were the only 2 guys in the UP during deer season not hunting deer! Always love you Andy. We'll show 'em how to make a real irish coffee, won't we. Wed, Feb 17, 2010 : 10:05 a.m.
Just reminiscing about Whiffletree Fries the other day with another long-time townie. Andy and his entrepreneurial spirit will be missed. Wed, Feb 17, 2010 : 9:56 a.m.
Andy was a feisty fellow. We butted heads a couple of times in his early years, but I always respected his drive and amazing work ethic. He lived his businesses and was dedicated to downtown Ann Arbor. I would suggest to the DDA to find some way to honor this man. Wed, Feb 17, 2010 : 9:31 a.m.
What a legacy--his presence will be missed, though footprint felt, on the downtown scene. Wed, Feb 17, 2010 : 9:07 a.m. Wed, Feb 17, 2010 : 8:40 a.m.
What a well-written and researched story! A-plus. Wed, Feb 17, 2010 : 8:26 a.m.
RIP&lt; Andy. We will miss you. Wed, Feb 17, 2010 : 8:11 a.m. The man is responsible for many, many beers down my gullet. I thank him profusely for being one of the only vendors in town to have a HUGE beer selection before that was popular. Where else could one find a goat attached to a beer? RIP is right. Wed, Feb 17, 2010 : 8:07 a.m. Wed, Feb 17, 2010 : 7:54 a.m.